A Different Vermont Pet Friendly Hotel Stay! Many hotels, inns, and bed and breakfasts claim to be a Vermont pet friendly hotel. They invite you to travel with your pet, but once you’ve arrived, you find that the best rooms are reserved for those without pets, while you and your dog are directed to the oldest and ugliest accommodations. On top of the less-than-lovely lodging, you have to pay a hefty per night pet charge, including a safety deposit. If you’ve ever experienced this kind of ‘pet-friendly vacation’, you’ll find the Phineas Swann Bed and Breakfast Inn to be a refreshing change. Relax in the plush comfort of our fully-remodeled and fully climate controlled historic Vermont inn, conveniently located only 7 miles from Jay Peak Resort. Our luxurious accommodations are furnished with fine antiques and romantic four-poster beds. 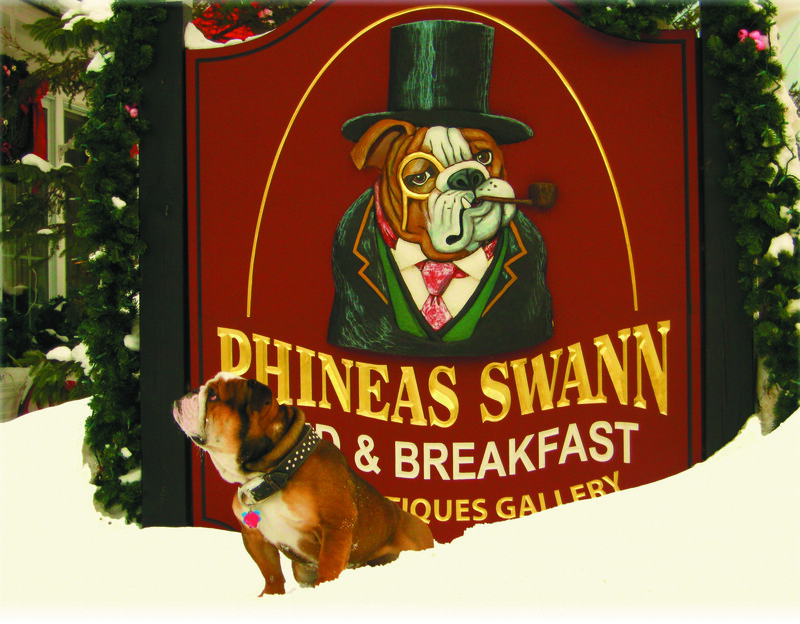 Unlike other luxury inns and boutique hotels, the Phineas Swann is a very pet-friendly inn. A great choice for a Jay Peak area vacation with your pet is our Deluxe Dog Spa Package – our package includes accommodations in our Honeymoon suite, doggie massage, grooming, bed-sleeping permission, and more! During the Winter, try our Pet Perfect Ski Package – this wonderful package includes lodging, breakfast (with a Doggie Bag treat for your pet), ski tickets to Jay Peak Ski Resort, dog-walking services, and a lot of TLC for your baby while you ski the slopes. CNN ranked us one of the world’s 12 most dog-friendly hotels, and Lanier Travel Guides awarded the Phineas Swann its Most Pet Friendly award twice. Read more about these prestigious awards on our Reviews page. 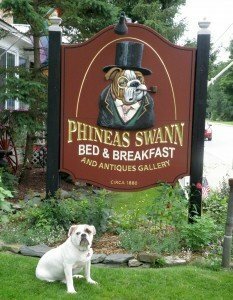 The Phineas Swann Bed and Breakfast Inn, a Jay Peak, Vermont pet friendly hotel, offers a TRUE pet friendly B&B vacation experience at a beautifully-restored romantic Vermont inn only 7 miles from Jay Peak. Unlike other lodging properties that will only tolerate your dog, we will welcome you and your pet with genuine enthusiasm. We have found that through the years, dog owners and their pets are among our most enjoyable guests. As a testament to our pet-friendly nature, the Phineas Swann was named one of the world’s 12 most dog-friendly hotels by CNN, and awarded two LanierBB.com Travel Guide Most Pet Friendly Awards. Visit our online Pet-Friendly Photo Gallery. We invite guests to submit their photos for inclusion – simply send us your favorite pictures of your dog(s) enjoying their vacation at the Phineas Swann, and we’ll post them for the enjoyment of all! 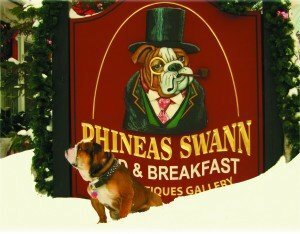 • The Phineas Swann Bed and Breakfast Inn is pleased to welcome dogs of all sizes and breeds, from Great Danes to Chihuahuas. • There is no per night charge for your pet. One dog is free, with a $25 flat fee per stay for each additional dog to assist with cleaning costs. • The Phineas Swann Bed and Breakfast Inn does not charge an extra cleaning fee for visitors who travel with pets, although we do ask you to remember the hard work of the cleaning staff and figure an extra gratuity if there is a lot of pet hair to clean. For an extra special vacation with your pet, consider our Deluxe Dog Spa Package, which includes accommodations in our luxurious Honeymoon Suite, dog-walking services every 3 hours, bed-sleeping permission, a bag of deluxe dog treats, and more! During the Winter, try our Pet Perfect Ski Package – this wonderful package includes lodging, breakfast (with a Doggie Bag treat for your pet), ski tickets to Jay Peak, dog-walking services, and a lot of TLC for your baby while you ski the slopes. The Phineas Swann Bed and Breakfast Inn is a pet-friendly inn in Vermont offering romantic luxury accommodations and located only 8 miles from Jay Peak Resort.We invite you and your dog to experience the pet-friendly nature and hospitality of the Phineas Swann Bed and Breakfast Inn. You’ll enjoy the luxury comforts of an old-fashioned inn with all the modern amenities one expects from deluxe accommodations, and your pet will be welcomed with enthusiasm. After all, a vacation without your dog is not really a vacation, is it?!! Please contact us if you have any questions at all about our pet-friendly lodging and policies.